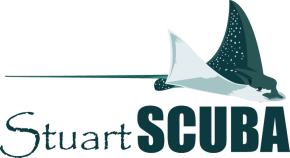 Stuart Scuba is a multi-agency training center offering training courses through NAUI, PADI, SDI, and TDI. We have a full staff of instructors ready to teach everything from Discover Scuba to Advanced Open Water. For those continuing their dive training education, we offer more advanced courses such as Rescue all the way up to Master Diver. If you are interested in technical diving, our staff will train you in Advanced Nitrox and Decompression, Trimix, or Wreck Penetration. For those looking for the ultimate challenge and enjoy Florida's springs, we offer Cavern and Cave training. Have you always wanted to work on a dive boat or perhaps teach your love of scuba diving to others? We can meet your needs with our professional level courses for both Divemaster and Instructor. For those courses requiring a minimum number of dives for completion, Stuart Scuba includes the price of the necessary rental scuba gear, scuba tanks (with appropriate gas for the course being taken) and the boat trip(s). Depending on the course, Discover Nitrox is also included for free! Schedule your Dive Training Course today! Stuart Scuba offers classes at your convenience with both mid-week and weekend classes available. For scheduling and pricing information, please call our shop at (772) 600 - 8288 and we will assist you in finding the classes and agency that's perfect for your needs. Stuart Scuba requires the use of each Training Agency's mandated Medical Release Forms before taking a course from that particular agency. Please download the appropriate form, fill it out, and bring it with you to class. Forms are also provided at the shop if you are unable to print them out for any reason. Please fill out this form prior to signing up for your course. Form is also provided at the shop. All students are responsible for purchasing either printed course materials or an eLearning access code ($79). Nearly all of Stuart Scuba's dive training courses include the rental gear necessary to complete the course, unless otherwise noted in the Course Outlines. Stuart Scuba's dive training includes the cost of any necessary boat dives to complete the course.